It’s looking more and more every day that I need to resurrect my former blog, UNSG.org, and again ask, who will be the next Secretary General of the UN? 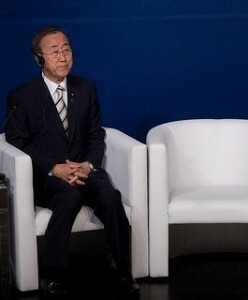 Judging from the past year, it doesn’t appear that it will be Ban Ki-moon for round two. Ban’s performance has suffered almost constant criticism from day one of his administration, but one could consider the past twelve months to be his “annus horribilis,” when the evaluations from media, governments and independent experts have been down right harsh. Unlike the bad year which his predecessor experienced, however, Ban is suffering not from criticism of and scandal at the institution he leads, but from his leadership itself of the institution, or rather the astute lack thereof. In June 2009, harsh reviews appeared in the Financial Times, The Economist, the London Times and Foreign Policy. In the latter, contributor Jacob Heilbrunn suggested that Ban had “set the standard for failure” among Secretary Generals. The Economist scored Ban’s management performance as 2 out of 10 and his ability to lead as 3 out of 10. The month, the UN Staff Union cast a unanimous vote of no confidence in Ban related to his implementation of the UN’s Capital Master Plan and human resources management. Ban’s critics have complained that he has been mostly ineffectual if not entirely absent in using his offices to engage on many of the world’s critical crises during his administration, such as Myanmar and Sri Lanka. Any one of these might have been justifiable had the criticism not been as persistent and pervasive as it has been. But at this point, such apologies are getting a bit embarrassing. James Traub, contributing writer at New York Times Magazine and author of a critical look at Kofi Annan’s tenure as UNSG, concluded this month that it’s just time to tell Ban good-bye. States that care about the United Nations — and above all, the United States — should prevent him from doing further harm to the institution by ensuring that he does not serve a second term. [The U.S.] Administration officials should be quietly consulting China and other allies, and should be looking for candidates — Asian or not — with the strength and stature to lead the organization. Ban Ki-moon is not such a man. There have already been a few names floated as possible successors to Ban, including Lula da Silva of Brazil, Helen Clark of New Zealand (currently UNDP Administrator), and possibly Kevin Rudd of Australia. Over the next couple of weeks, we’ll look at the potential of challengers to Ban’s re-nomination and other factors that may determine his chances in 2011.